This artist's conception shows how Saturn's giant Phoebe ring would appear as seen in infrared light. Here, the ring is set against a background of stars lit by faint nebulas. A giant ring around Saturn is even larger than thought, spanning an area of space nearly 7,000 times larger than Saturn itself, researchers say. "We knew it was the biggest ring, but now we find it's even bigger than we thought, new and improved," the study's lead author, Douglas Hamilton, a planetary scientist at the University of Maryland, College Park, told Space.com. 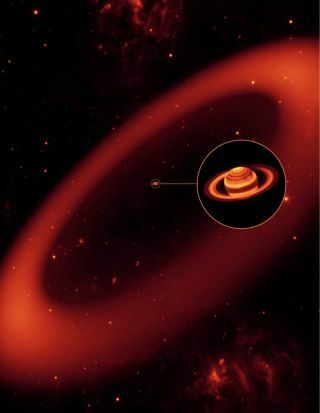 The immense ring was discovered around Saturn in 2009. The dark grains of dust making up this faint ring are probably debris that cosmic impacts knocked off the gas giant's distant and equally dark moon Phoebe. This image of Saturn's dusty Phoebe ring, captured in 2009, shows the dust ring (inset) overlayed in tan colors based on data and observations. The Phoebe ring is much larger than Saturn's main ring and tilted with respect to Saturn as indicated here. Astronomers first suspected the existence of the Phoebe ring after looking at one of Saturn's other moons, Iapetus. "Like our moon, Iapetus always has one side facing toward Saturn, which means it also always has one side pointing in the direction of its motion around Saturn, its leading side," Hamilton said. "Iapetus is an icy moon, and intrinsically bright white, but its leading face is very strikingly jet black. That contamination is what led us to look for what turned out to be a surprisingly large ring." New infrared images from NASA's WISE spacecraft reveal the Phoebe ring actually extends between distances of 100 to a surprisingly distant 270 times the radius of Saturn — that is, about 3.75 million to 10.1 million miles (6 million to 16.2 million km) from the planet. The dark grains making up the Phoebe ring absorb sunlight, which makes the ring difficult to see if one looks for visible light but much easier to see if one looks for heat in the form of infrared radiation, which the WISE spacecraft imaged. The researchers noted their new estimates are conservative ones. The Phoebe ring may actually extend between distances of 50 to more than 270 times the radius of Saturn. The Phoebe ring is made up mainly of dust particles about 10 to 20 microns in size, or about one-tenth to one-fifth the average width of a human hair. Rocks that are the size of soccer balls or larger with diameters of more than about 7.8 inches (20 centimeters) make up no more than about 10 percent of the ring. This NASA graphic shows the relationship between Saturn's giant Phoebe ring and the planet's moons Phoebe and Iapetus. Phoebe serves as the source of the ring's material while Iapetus is embedded in the ring. The particles making up the Phoebe ring may be millions to billions of years old, Hamilton said. Their extreme age is most likely due to how spread out they are, and thus unlikely to strike and destroy each other in collisions. "A cubic kilometer of space in the Phoebe ring might have just a few dozen dust particles, maybe 100 at most," Hamilton said. "It's really empty." These findings suggest that Saturn possesses three kinds of rings, Hamilton said. The main rings are constantly changing, made of fast-moving house-size chunks of ice that gently collide, break apart and reform every hour or so. The E ring is filled with frozen water droplets from geysers on the icy moon Enceladus that last maybe a century or so before they strike another moon of Saturn or get blown away from the gas giant's orbit entirely. The vast Phoebe ring has million- to billion-year-old dust particles, and likely some larger objects as well. "Saturn's main rings are like the fabled elephant graveyard — mysterious and filled with mostly large bones that contain clues about the recent past," Hamilton said. "The E ring, then, is the chipmunk graveyard in which all of the bones are small and from the modern era, and the Phoebe ring is the dinosaur graveyard in which we find ancient bones of all sizes, most of them tiny fragments but some quite immense." Hamilton and his colleagues suspect that Jupiter may possess a similarly giant ring. "Whenever a planet has a distant satellite, it will probably have a distant ring as well," he said. "We see Saturn's because it's bright enough to image; Jupiter's is probably fainter and harder to spot." In the future, Hamilton and his colleagues would like to use Earth's largest ground telescopes to see the Phoebe ring using visible light. "In combination with our infrared data, this will give us more information on the particle sizes in the Phoebe ring than we have today," he said. The scientists detailed their findings in the June 11 issue of the journal Nature.